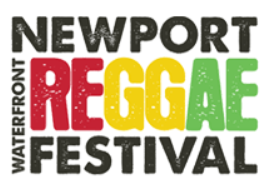 The sun was just starting to come out from behind the clouds when we arrived at the Newport Waterfront Reggae festival that afternoon and the show had been going strong for several hours. Huge throngs of people were milling around the concrete, eating, drinking, and enjoying the warm weather. The sounds of Bushman were being pumped through the speakers and after making our way through the huge white tent in the corner of the grounds, we found the stage and the crowd gathered around it. Bushman was going strong and the crowd seemed to be groovin’ right along with him, though for the sake of accuracy, the amount of Red Stripe that promoters had stocked up on for the sake of thematic precision would let these fest-goers groove with most things. As we wandered around the summer-y little town of Newport, it was hard not to notice the wide variety of people who had come out to hear some music. Families were everywhere with little children in tow, a handful of older Rastas had congregated along the side of the side of the street sporting the reddest eyes I think I’ve ever seen. People of all ages sprawled along the pavement waiting for the next act, Junior Marvin of the famed Wailers. In the mean time we passed the minutes by counting the number of white 20-somethings we saw wearing Bob Marley t-shirts. I think I lost count somewhere in the thirties. When Marvin took the stage, he promptly introduced himself and settled into a Marley classic, “Natty Dread”. Marvin’s set was one of the key events in the day that had me battling between my own cynicism and my desire to just chill out and have a day in the sun, listening to music with a friend. I love Bob Marley as much as the next guy; I don’t know if any other reggae artist has written as many classic tunes or has managed to transcend the genre as Bob has. At the same time, watching a former member of his band being trotted out to do an entire set of songs written by his legendary bandmate was enough to bum me out at least a little. When people hear the word reggae, they instantly think of Bob. His shadow hangs over the music and always will. Hearing all these covers just made me feel as though the promoters had thought that, “Well, the people want Bob Marley, so that’s what we’ll give ‘em”. At the same time, I wouldn’t deny I enjoyed hearing tracks like “Positive Vibration” live and loud in all it’s glory. At about 8 PM, headliner Barrington Levy took the stage. It was dark by then and the light show was in full effect. As someone with little experience with the festival circuit and the outdoor shows that come with it, I found that the display helped me get a bit more invested in the gig. Levy seemed in fine form, his voice was clear and his band was tight, executing his hits with power and style. Familiar tunes like the classic “Under Mi Sensi” and “Seedless” whipped the crowd up, and people across the spectrum all seemed to be having a good time. Levy was by far the biggest name of the day and he made sure to live up to his own hype, dancing and jumping around the stage with energy to spare. As I watched the happenings in front of me, I couldn’t help but be conscious of the crowd surrounding me. By this time the families and quiet music types had drifted toward the back, while the bros and various “good vibe” seekers had crowded up to the stage. I felt like I could find most of these dudes just as easily at a dubstup show or at some arena rock gig. While people using this opportunity to throw on their old Bob Marley shirt and roll a sloppy J may have offended my snobby music-nerd college kid sensibilities, it isn’t my place to dictate how reggae is perceived and treated by it’s fans. I can only hope that reggae music as a whole isn’t relegated to a cartoonized version of itself only for those looking for the day’s fix, and that the tension and musicality of the genre remains relevant to those who came to find it.